Jinhao is one of the few well known China fountain pen manufacturers - Baoer, Hero and Duke being are the others. I do not have much experience with Jinhao pens, other than the Jinhao 3000 that I’ve reviewed previously. China made fountain pens are almost always cheap. (Read this to find out why) And because of the low prices, I wouldn’t expect much in the way of quality or workmanship. However at the same time, if the pen works it would have been a great bargain. The Jinhao X750 is a cigar shaped brass fountain pen. It comes in a variety of colours but the shop only have black and silver. I opted for the silver one. The clip is very, very stiff. It is very difficult to slide it over a pocket or a notebook. You are more prone to have the cap disengaged from the body and fly off the barrel than to get it clipped onto a note book. Make sure you have your finger on the top of the cap while clipping, to prevent the cap from taking out someone’s eye. The cap disengages from the barrel with a pull. It snaps close with an audible click. The cap is securely attached to the barrel. I am not worried the cap loosening in my pen case. 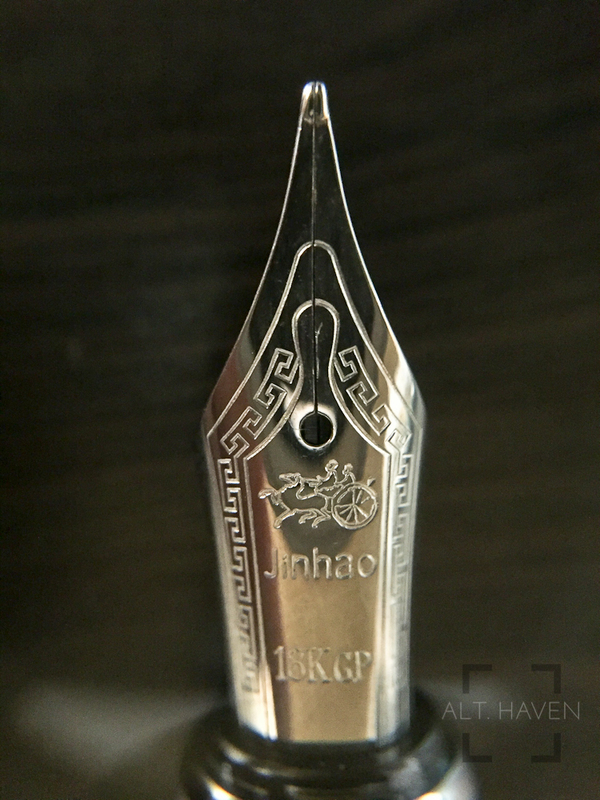 The centre band is silver and etched with the words “JINHAO” and “X750” on opposite ends with some flourishes separating them. 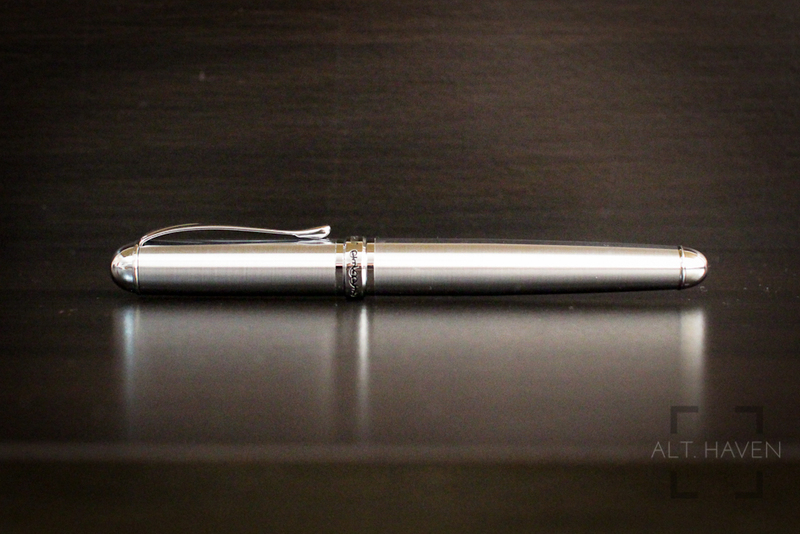 Both ends of the Jinhao X750, clip and centre band has a polished mirror finish while the body is a brushed metal finish. The pen is nice to the touch but heavy. The Jinhao X750 is a hefty pen weighing in at 37g. The Pilot Metropolitan has a more manageable weight for a brass pen. However, the Jinhao X750 is still fairly well balanced as long as you don’t post the cap. The cap can be posted but I found with the cap posted, the pen becomes entirely unwieldy. Once the cap is popped off, you will find a black plastic grip section. The grip section tapers towards a metal ring separating the nib from the grip section. This metal ring is slightly wider than the grip section. It gives the finger a nice resting point if you grip close to the nib. The Jinhao X750 comes with a standard international converter. However it takes a standard international cartridge if you prefer that. The nib that the Jinhao X750 comes with is a decent #6 size stainless steel nib. There is nice artwork on the nib itself. It is labeled 18Kgp. Personally, I have no idea what that means. The nib’s colour isn’t entirely silver, it is a little yellow. Maybe the label was referencing that? Jinhao X750 comes with only one nib size option. It writes very much like a medium nib. It is a very wet nib even when I filled it with Pelikan Mandarin. However, if you are not satisfied with their nibs, you can swap the nib out with any #6 nibs you have lying around. Check out the Well Appointed Desk’s post on this. Many in the Singapore Fountain Pen Lovers’ group have been creating their own frankenpen by swapping the nib with a dip nib. The Jinhao X750 is a value for money fountain pen. It comes complete with a converter so you are all ready to write once you get your hands on some ink. The pen can be easily upgraded the pen by swapping out the nib with any #6 nibs. It is a real bargain considering the price I got it at. Now, for my try at creating my own frankenpen!